Deers are any of the species belonging to the taxonomic Family Cervidae. They are perhaps best known as a game animal for meat and trophy. Male deers and some females grow antlers that are prized by trophy hunters. They have a keen sense of sight, hearing, and smell that we humans can only dream of. They have a speed that is most of the time unmatchable by predators. Deers are distinguished by their long beautiful antlers. These antlers are formed from birth when they are born with little bumps on their head, that later grow into a long bone covered in a velvet lining. 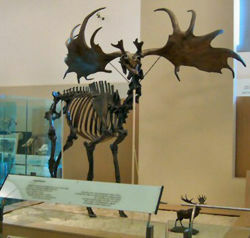 These antlers grow typically on males. The only female deers known to have antlers are the Caribou and their cousins the Reindeer. Antlers are shed and re-grown each year. They are used to fight for their mates, and for marking territory. When marking their territory they rub up against a tree with their eyes and forehead. Above each eye on a deer is a gland that gives us a scent called pheromone. This leaves of a smell that tells other male deer that this territory has already been claimed. This action is called "rubs." This is a major way that hunters like to track down deer. Along with their antlers comes a long body with strong legs to endure the terrain on which they live on. Deers have a four chambered stomach which allow them to chew cud, and vegetation. One of the chambers allows them to eat a large amount of food very quickly leaving the deer to not be exposed to the outside for too long. 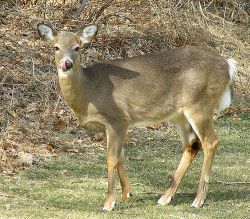 Deer eat different foods for different seasons. For the summer time when it is nice and hot outside they will eat twigs, stems, and mature leaves because the heat had dried everything out. 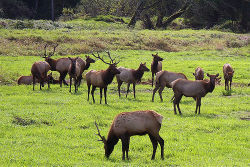 During the spring they will eat grass, flowers, buds, and young leaves. During the winter they will eat twigs, and small branches, and if food is scarce everywhere they will eat bark. Reproduction is taken place when the mating process has successfully come to an end. Mating for the deers consists of two bucks(male deer) fighting each other for a doe. After the stronger buck has won he will claim his prize by mating with the doe. The gestation period can vary anywhere from 7-10 months in the womb. When a mother is about ready to give birth to her young, she will make for herself a "nest." This nest is a symbol to her that it will keep her and her offspring safe while giving birth. She will stay in this nest for about a week, lining the inside with dead leaves, and grass to comfort her as she will give birth. During this period however she will continue to eat and drink as normal and walk around if needed. When it is time for the offspring to come out, the front two legs will come out first. The doe will then decide if she is ready or not to deliver the fawn yet. If she is she will stand up and then the fawn will proceed to come out, head next then followed by the rest of the body. When the fawn is born it is dropped from a high point, leaving it to take a hard fall and breaking it's umbilical cord. Most fawns will then be born in late spring early summer. By the time they reach seven months the males should weigh around 85 pounds, while the females weigh 80 pounds. When males are born, they are born with little bumps on their head that will later grow into antlers. Females however are born with many white spots that will fade as she grows older. Reindeer- female reindeer can weigh up to 170 kilograms, while the male can grow up to 300 kilograms. For this particular deer both male and female grow antlers. Reindeer have a four chambered stomach that allow it to eat all its favorite foods such as the reindeer moss, lichens, twigs, and leaves. Reindeer's have special hooves that adapt to each season. During the summer the hooves become spongy and help provide extra traction. In the winter the pads on the hooves shrink and tighten, allowing the hoof to dig into the ice and get a better grip. Moose- the moose has a long lanky body that helps its audience determine who he is. His muzzle is long and fleshy with a naked patch below it's nostrils. Males have a sac that hangs from it's neck called the bell. Moose usually eat leaves of a willow and birch trees, tree bark, nuts, and water plants. On one side of the lower jaw it consists of 3 molars, 3 premolars, and 4 front teeth. On the top jaw instead of there being front teeth, a plate of horn replaces them. This plate helps to chew the food down faster and easier. The most common use for a deer is deer meat. Many people hunt deer for different reasons but all end up eating or selling the meat. This deer meat that is eaten is called venison. After killing the deer many skin it and use its head as a trophy to show how big of a buck or doe they had hunted down and killed. The skin may be used for shoes, boots, and gloves, while the antlers can be used to make buttons and knife handles. Many people use the musk that is found in the abdomen of the musk deer as medicine and perfume. This page was last modified on 23 April 2015, at 16:17.